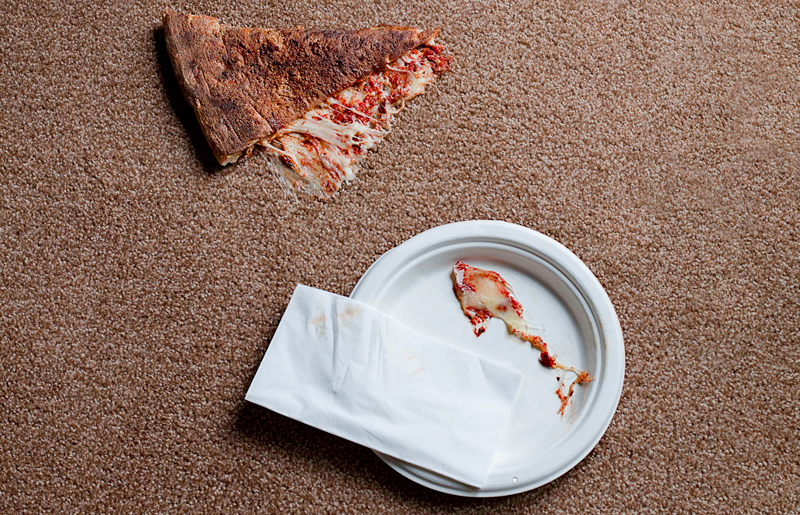 Wine... greasy pizza... pet accidents... ink... these words alone can strike fear in the hearts of a carpet owner. Yet at one time or another, we're all likely to find one of them spilled onto our beautiful carpet. Moving the furniture to hide the stain probably isn't the best option. Let's look at some more practical ways to tackle difficult carpet stains. Our top recommendation for handling difficult carpet stains is to be prepared! Within easy reach of any room with carpet have a cleaning kit on hand. That cleaning kit should contain white towels or rags and a spray bottle filled with water. That's it! We're not suggesting that will get out every type of stain but if it's near at hand, using those two tools will help you minimize the damage. As soon as a spill happens - or as soon as you see it - blot the spill with your towels. Never rub - rubbing can actually drive the stain further into the carpet padding and ruin your carpet yarns. Always blot, and blot, and blot some more to soak up as much of the stain as possible. If it's a big stain that soaks into one of your towels, be sure to have another one handy. Once you've blotted up as much as you can, wet the area with clean water and blot some more to try and soak up bits that have started to dry into the carpet. If you're lucky, that's all you'll need to do to take care of a carpet stain. However, many times you don't see the spill happen - that's when you need a little extra help. You can add to your carpet cleaning kit with products that are recommended by your carpet manufacturer. There are plenty of homegrown solutions out there - and we'll share some of the more practical ones below - but when your carpet is under warranty you should only be using cleaning materials that are approved by your manufacturer. Get a second spray bottle for your cleaning kit and fill it with 1/4 cup of white vinegar, 1 tablespoon of Dawn dish soap, and the rest with water. This cleaning solution is a great way to attack coffee, wine, kool-aid, soda, and food spills. Blood stains are best tackled with cold water. If the blood is not fresh, add a tablespoon of Oxyclean to the spray bottle. Oxyclean is bleach free and does a great job picking up hard stains. Pet accidents can sometimes be neutralized with warm water and white vinegar. Soak the stain thoroughly with the vinegar solution and allow it to soak into the carpet for at least five minutes. Then blot with dry, clean towels until the stain is gone. Looking for more care and maintenance tips for your carpet? Check out our free Carpet Care Guide.